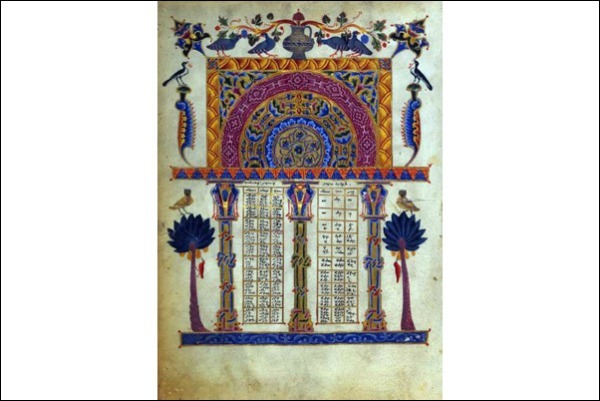 The medieval illuminated manuscript known as the Zeyt'un Gospels was rumored to hold supernatural powers that would protect the Armenian people. Whether or not that's the case, the manuscript itself has eluded destruction. Created by the Armenian illuminator T'oros Roslin in 1256 for Constantine I, the head of the Armenian Orthodox Church's Holy See of the Great House of Cilicia, the book passed through unknown numbers of hands, survived the Armenian genocide and ended up in a museum of ancient manuscripts in Yerevan. There it sits today. But it is missing eight pages — folios, really. There's no mystery about where they are. The J. Paul Getty Museum bought them from an Armenian American family in Massachusetts for just under $1 million in 1994. They are elaborately painted canon tables, sort of an appendix to the gospels. One of the pages, so rich with detail that it looks like a mosaic, hangs on a wall of the Getty in Los Angeles. The others are in storage. These are the simplest facts in a legal battle that has pitted the Getty against the Armenian Apostolic Church of America, acting on behalf of its mother church overseas. The church claims the eight pages were stolen by a relative of the sellers some 90 years ago and that the Getty therefore had no right to buy them. The Getty contends that it has title free and clear. An L.A. Superior Court judge on Nov. 3 denied the museum's motion to dismiss the claim and ordered both sides to mediation. Unfortunately, the two sides can't seem to agree on much. Getty officials say they were told by the sellers that their relative owned the book when he fled the tumult that began during World War I and culminated in the genocide of more than 1 million Armenians. Unable to carry out the entire book, the man removed eight pages and left the rest with a Protestant missionary. Getty staff say the story is supported by a 1943 essay by an art expert and Armenian church figure who saw the tables and wrote that the owner had inherited them from his father. He didn't connect them to the Zeyt'un Gospels, but nine years later, an art historian did. The pages were later put on display at the Pierpont Morgan Library in New York. According to Elizabeth Morrison, the Getty's acting senior curator of manuscripts, the pages were identified in the exhibition catalog as part of the Zeyt'un Gospels in the Matenadaran, the museum and archive in Armenia. Despite the published article and the high-profile exhibit, Getty officials say that for years no one came forward to question the legitimacy of the family's ownership. The Getty, rocked by scandal over its possession of antiquities that other nations claimed had been stolen, gave back 40 pieces of art to Italy and four to Greece several years ago and instituted one of the strictest acquisition policies of any museum in the world. Although the Zeyt'un folios were acquired in the 1990s, Morrison says the level of due diligence exercised in determining their provenance then would meet the museum's standards today. The Armenians note that these were pages from a manuscript that had been a treasure of the Armenian church since the 13th century. The book, they say, was handed off for safekeeping during the genocide, then rapidly changed hands again and again until it was passed to the man who removed the pages. They argue, and some experts agree, that it's unthinkable that Armenian church authorities, even during a time of turmoil, would have knowingly sold it or given it away. So where does that leave things? With a murky case of who knew what when, and little chance of ever learning which version of the facts is accurate. It's good that the Getty has instituted tighter rules for determining the provenance of new acquisitions, but it still needs to address situations in which the work was acquired before the rules were tightened. Every acquisition is different, but in this case, we wish Getty officials had contacted the museum that houses the manuscript from which the canon tables were extracted to ask if, perhaps, there was an issue. On the other hand, it's a little disingenuous for lawyers representing the Armenian church to argue both that the manuscript is one of its great historic treasures and, at the same time, that church officials did not even realize the canon tables were missing until 2006, when a Los Angeles lawyer discovered that they were at the Getty. That's a convenient argument that allows the church's claim to fall within the statute of limitations. Getty officials are rightly skeptical. That said, this is ultimately a custody case. In the absence of clear-cut facts, the remaining question is where, ethically and culturally, these works should reside. On the walls and in the vaults of a world-renowned, much-visited American museum? Or with the original manuscript in the region where they were commissioned 755 years ago? It would be better, in our view, if the pages were reunited with the book from which all agree they were severed. That's a common approach to dismembered statues, although it can be more complicated with manuscripts, if they've been cut apart and scattered. But in this case, the book is intact in Armenia save for the folios at the Getty. If the Getty agrees to return the pages, it should at the very least be permitted to exhibit the entire Zeyt'un Gospels with the canon tables. It would be a rare opportunity for the museum's huge visitorship and Southern California's large Armenian community, and would touch far more people than can visit the Matenadaran. And that seems an appropriate act of international goodwill and cultural enrichment..